The combination of the waterproof breathable Gore-Tex XCR insert and a full goat leather shell make the Black Diamond Legend Glove tough enough to handle winter’s nastiest mid-winter mood swings. 170g PrimaLoft One insulation on the back of the hand boosts warmth while lighter 133g PrimaLoft insulation at the palm retains dexterity. 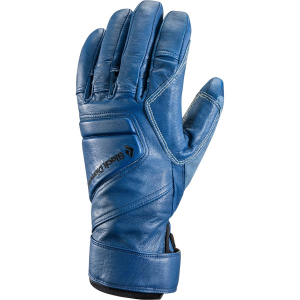 Reinforced leather palms and fingers provide durability for mountain professionals. The Legend Glove also includes molded EVA foam knuckles for extra protection when the tree run turns out to be a bit tighter than you expected.